Nearly the entire shoreline of the north side of Lake Osborne between Lake Worth Road and 6th Avenue South is accessible to shore anglers. The E-4 Canal and associated lakes and lateral canals provide excellent fishing for largemouth bass, bluegill and redear sunfish. Sunshine bass are also stocked in Lakes Ida, Eden, and Osborne. Canal intersections and culverts are generally productive areas for catching most species of fish. Shoreline vegetation, rip-rap areas, and shady areas associated with bridges and culverts also provide excellent places to fish. If there is a strong current in the main canal, look for any protected areas that offer refuge from the current (e.g., cut-outs, bridge pilings, and the downstream side of non-flowing spillways of lateral canals). The downstream side of culverts and spillways with flowing water are sometimes especially good places to fish. 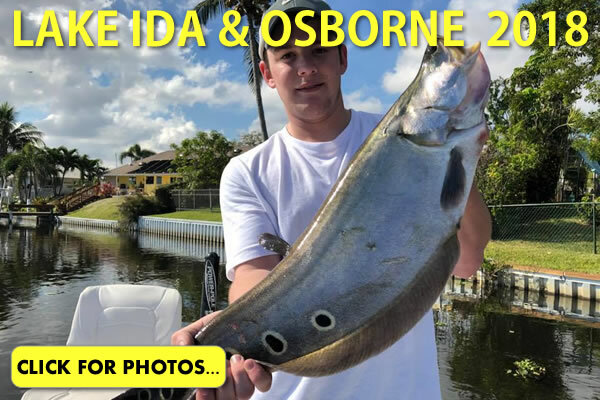 Fish attractors, identified by bright yellow buoys in lakes Ida, Eden and Osborne, are also good fishing spots.